Gathering My Roses: Paper Scissors Rock -- Review & Giveaway - CLOSED! Paper Scissors Rock -- Review & Giveaway - CLOSED! I love unusual items for my home. So I was delighted to discover a company called Paper Scissors Rock! They offer a unique line of whimsical Nightlights, Wall and Alarm Clocks, Glass Gem Magnets, Book Marks, and Greeting Cards. 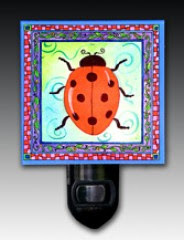 I was the lucky recipient of a gorgeous Ladybug Nightlight! It's beautiful and the photos do not do it justice at all! It has a lovely glow that softly illuminates the room at night. Everytime I see it, it reminds me of Lizz (Whose nickname has been Ladybug all of her life). Our beautiful Night Lights are made of durable acrylic, and come with a standard four watt night light bulb. Square light images are 3'' x 3''. Rectangular images are 4'' high and vary slightly in width. Gift Box Included. The Wall Clocks of Paper Scissors Rock! are simply stunning! They look like Tiles and you'd expect them to be heavy but they are, in fact, very light! They are not made of ceramic so they will never break! Paper Scissors Rock also offers a Lifetime Warranty on all of their Wall Clocks! The Alarm Clocks are 2'' square with a round face. The second hand is a small image printed on a rotating Lucite disk, which appears to float above the clock face. So, for example, on the Cat Alarm Clock the little mouse runs around the edge of the clock, on the Dog Alarm Clock a tiny bone counts the seconds, etc. Each alarm clock comes in a gift box and a free battery is included with each one. So who is the artist behind these amazing creations? Please allow me to introduce you! 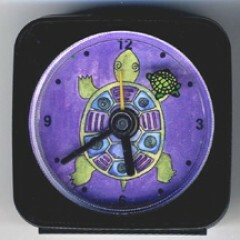 Paper Scissors Rock clocks and magnets are reproductions of original paintings by Northwest Artist Pamela Corwin and are created in her studio in Olympia, Washington. Pamela works in acrylics and watercolors, sometimes adding elements of collage to her work. She has been in business since 1981 and her work has been featured on several national television shows and in magazines such as House Beautiful, Seventeen and Pacific Northwest. In 1996 she was commissioned to paint an egg for the White House Easter tree and designed the Pike Place Market Festival Poster in 2000. Pamela also teaches local classes on the business of crafts. For more information on classes or on arranging a workshop in your area, visit the Business of Crafts Website. Pam has designed a mousepad for Coldwater Creek Catalog, and was commissioned to paint an egg for the White House Easter Tree in 1996 and the Pike Place Market Festival Poster in 2000. For many years she painted hand painted egg shells and was known for her work all over the country. She has appeared on several television shows, including a feature story on the National News, and her work was featured in articles in Seventeen, House Beautiful and Washington, and Pacific Northwest magazines. She has also designed jewelry, CD covers, T-shirts, tote bags, and mousepads for various other companies. 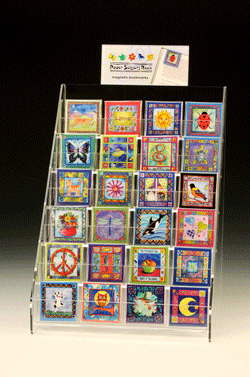 Right now, Paper Scissors Rock is holding a contest for their Magnetic Bookmarks -- Hurry! Contest Ends on August 30th! @psrock on Twitter and Paper Scissor Rock Fans on Facebook! Paper Scissors Rock has generously offered one of our lucky readers the chance to win a $25 GC to purchase an item of their choice! Just follow the entry directions below for your chance to enter and win! Visit Paper Scissors Rock and tell me which item(s) you'll buy with your $25 GC! 10. Grab my button and post it to your sidebar or favourites page! +3 Entries. Leave three comments! This contest will be open from Saturday, August 6th until Wednesday, August 17th. Winner will be announced on Thursday, August 18h. Disclosure: I was provided with a Nightlight for the purpose of this review and giveaway. I received no other compensation. My opinion is based solely on my own experience and use of the items reviewed. I'll buy the cute butterfly nightlight for my lil sis when I win! I really like the Cat with the mouse alarm clock. I love the Dancing Dog nightlight. TOO CUTE. i would get some magnetic bookmarks. they are nice enough to hang on the frig! I'd love to get the Dancing Dog nightlight. I visited Paper Scissors Rock and I would buy the butterfly nightlight! I liked Paper Scissors Rock on Facebook! I followed @psrock on twitter. I visited the website and the products are so cool! I love the cat clock. my kids would love new nightlights! really like the cupcake one! I like the Music clock for my hubbys bday. He is a musician so it would be perfect for him. I might get the Ladybug (Have a great day!) card. I love the Dancing Dog Night Light. I love the butterfly nightlight. I would get the butterfly nightlight. I like Paper Scissors Rock on Facebook. 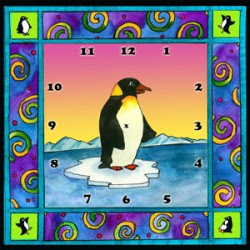 I would buy the Penguin clock my youngest son is redoing his room in an Antarctic theme and it would work perfect. I would get the heart nightlight. If I won, I might get the Hummingbird Nightlight and the Fruit of the Vine Wall Clock, and some greeting cards! I'd order the tennis alarm clock!